Recruitment is expensive, and time-consuming. One of the biggest HR expenses for small businesses is spending time and money on recruitment, only to lose new employees within the first three months. The most common complaints we hear when conducting exit interviews on behalf of clients is that new starters weren’t given enough information and felt unsupported and left to their own devices. 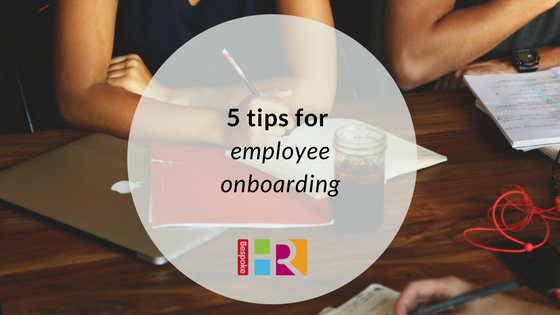 A good onboarding programme is crucial to make new hires feel welcome, and motivate them to stay at your business. Send an email to team members with information about the new starter, where they have come from and some interesting detail about them. That way, your staff will be ready to welcome them by name on their first day. Start with a meeting with the line-manager to talk through the business, and supply them with background to the company (including dress code, working hours and lunch breaks). This is also a good opportunity to discuss what’s expected in the first week, ease them into the role and support them as they get up to speed with what’s required. Don’t forget to demonstrate how the office equipment works, where they can find the photocopier and how to use the telephone system. Introduce them to colleagues by taking them around the office and initiating chats with each. It may sound obvious, but arriving in a new job to find there’s no desk or PC available can be demoralising. Being shown to a desk that’s set up, equipped with resources and ready to go shows the employee that your business is organised and professional. This will help you to review their progress, but also let them know they are supported and will have a chance to feedback on any issues or teething problems. You may only need to host these meetings for the first three months which will take you up to the probation period end, but gives you the opportunity to iron out any issues before the probation period ends. Or order lunch in. It’s a nice way to welcome a new employee and gives them the chance to chat informally to their colleagues over lunch. Little gestures like this can make a massive difference to the first impression about your business. Don’t be afraid to ask your existing employees what they think should be included in the onboarding process. They will have a better insight into what would make them feel welcome and valued. We can help set up an onboarding scheme at your business, call us for 15 mins of free HR advice.